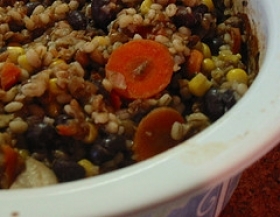 Have you made Barley Vegetable Casserole? 1. 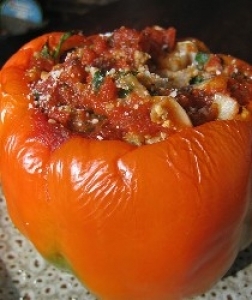 Preheat oven to 350 F Lightly oil a 1 3/4-quart casserole or spray with nonstick cooking spray. 2. Melt 1 tablespoon of the margarine in a large nonstick skillet over medium heat. 3. 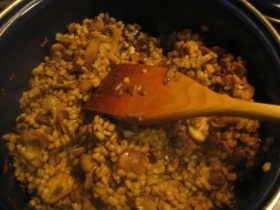 Add barley and cook 2-3 minutes, stirring frequently until lightly browned. 4. 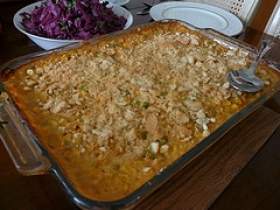 Place in prepared casserole. Melt remaining margarine in skillet. 5. Add onions and cauliflower. Cook, stirring frequently, 5 minutes. 6. Add mushrooms and carrots. Cook 5 more minutes, stirring frequently. 7. 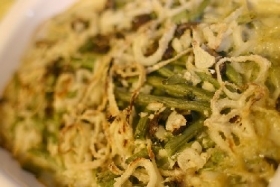 Add vegetables to casserole. 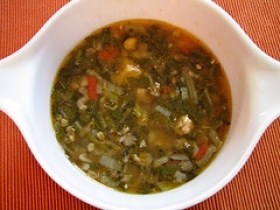 In a small bowl, combine water, broth mix, garlic powder and pepper. 8. Mix well and add to casserole. 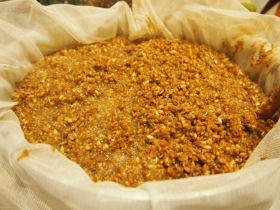 mix well, cover and bake 1 hour and 15 minutes, until barley is tender and most of the liquid has been absorbed. 9. Stir several times while baking. Let stand 5 minutes, then mix and serve. This recipe contains potential food allergens and will effect people with Mushroom, Malt, Garlic, Onion allergies.